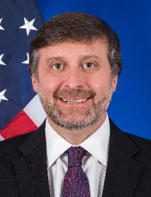 Matthew Palmer is a member of the Senior Foreign Service (class of Counselor) and serves currently as Deputy Assistant Secretary in the Bureau of European and Eurasian Affairs with responsibility for the Western Balkans and the Aegean. Previously, he was Director of the Office of South Central Europe. Earlier tours included Belgrade, Nicosia, the U.S. Mission to the United Nations, and various positions in Washington, including on the Secretary's Policy Planning staff and at the National Security Council. Matt is the author of a series of novels published by Penguin Random House featuring American diplomats as protagonists, three of which were selected by National Public Radio as being among the best books of their respective years. Matt is a distinguished graduate of the National War College and a member of the Council on Foreign Relations. He speaks Serbian, Greek and Japanese.